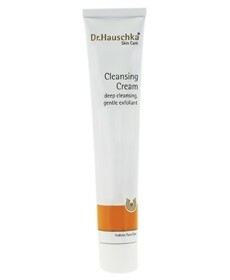 - Maintains the pH balance so that the acidic barrier protecting your skin is not broken down. - Maintains and supports the skin's natural moisture level. As soon as I tried this I feel in love. The colour is beige and there is a natural smell about it. If this is off putting to you, power through as it is so worth it. There is a rough and gritty texture which isn't to be used as an exfoliant, it's the nut pieces. You GENTLY rub it onto your face and what it does is amazing. Your skin feels plump, soft and silky. Dead skin is gone, and I am not joking when I say I rub my face a few times before carrying on with my routine. I can't praise this cleanser enough (or the brand in general). It makes a face routine a joy. There is only one downside which is the price. It's worth every penny though. If you are looking for a new face routine get this, you wont be disappointed. The silky smoothness of my face after use. This cleanser makes me want to keep to a routine and makes washing my face not a hassle. The price (only because you will want to use this morning and night therefore it would be used up quickly). The smell may be off putting. Would be nicer having a pump action dispenser so you don't want to waste any. Effective, enjoyable and my new all time favourite! "As soon as I tried this I feel in love. The colour is beige and there is a natural smell about it. If this..."